What's the difference between Instant and LocalDateTime? Instant is rather a "technical" timestamp representation (nanoseconds) for computing. LocalDateTime is rather date/clock representation including time-zones for humans. Still in the end IMO both can be taken as type for most application use-cases. As example: Currently I am running a batch job where I need to calculate a next run based on dates and I am struggling to find a pros/cons between these two types (apart from the nanosecond precision advantage of Instant and the time-zone part of LocalDateTime). Can you name some application examples, where only Instant or LocalDateTime should be used? Instant and LocalDateTime are two entirely different animals: One represents a moment, the other does not. Instant represents a moment, a specific point in the timeline. LocalDateTime represents a date and a time-of-day. But lacking a time zone or offset-from-UTC, this class cannot represent a moment. It represents potential moments along a range of about 26 to 27 hours, the range of all time zones around the globe. Your statement is incorrect: A LocalDateTime has no time zone. Having no time zone is the entire point of that class. So Local… means “not zoned”. An Instant is a moment on the timeline in UTC, a count of nanoseconds since the epoch of the first moment of 1970 UTC (basically, see class doc for nitty-gritty details). Since most of your business logic, data storage, and data exchange should be in UTC, this is a handy class to be used often. Instant instant = Instant.now() ;  // Capture the current moment in UTC. Similar to Instant is the class OffsetDateTime. This class represents a moment as a date and time with a context of some number of hours-minutes-seconds ahead of, or behind, UTC. If the number is zero, an OffsetDateTime represents a moment in UTC the same as an Instant. A ZoneId is a time zone. A time zone is an offset of so many hours and minutes away from UTC. A new day dawns earlier in Paris than in Montréal, for example. So we need to move the clock’s hands to better reflect noon (when the Sun is directly overhead) for a given region. The further away eastward/westward from the UTC line in west Europe/Africa the larger the offset. Plus, a time zone is a set of rules for handling adjustments and anomalies as practiced by a local community or region. The most common anomaly is the all-too-popular lunacy known as Daylight Saving Time (DST). A time zone has the history of past rules, present rules, and rules confirmed for the near future. These rules change more often than you might expect. Be sure to keep your date-time library's rules, usually a copy of the 'tz' database, up to date. 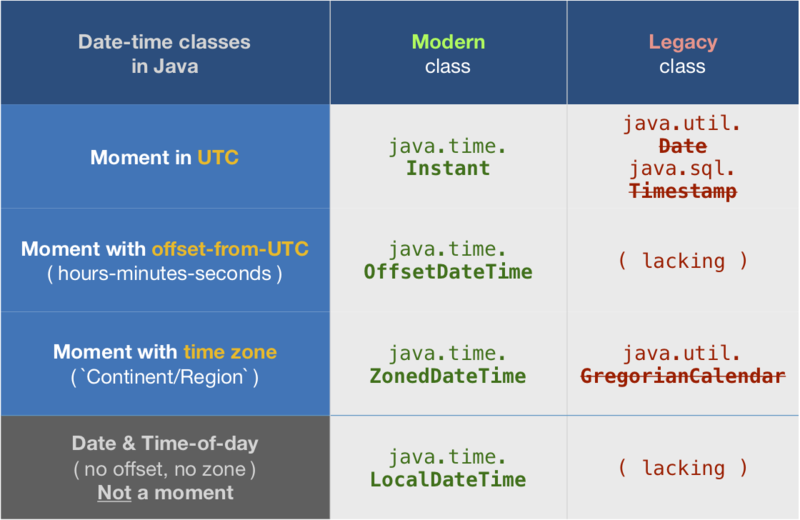 Keeping up-to-date is easier than ever now in Java 8 with Oracle releasing a Timezone Updater Tool. Use proper time zone names. These names take the form of continent plus a SLASH plus a city or region. Avoid the 3-4 letter codes such as EST or IST. They are neither standardized nor unique. They further confuse the messiness of DST. Sometimes we have only an offset without the rules. Java provides the ZoneOffset for this purpose, a subclass of ZoneId. Note the handy constant defined there, ZoneOffset.UTC. Think of ZonedDateTime conceptually as an Instant with an assigned ZoneId. Nearly all of your backend, database, business logic, data persistence, data exchange should all be in UTC. But for presentation to users you need to adjust into a time zone expected by the user. This is the purpose of the ZonedDateTime class and the formatter classes used to generate String representations of those date-time values. The "local" date time classes, LocalDateTime, LocalDate, LocalTime, are a different kind of critter. The are not tied to any one locality or time zone. They are not tied to the timeline. They have no real meaning until you apply them to a locality to find a point on the timeline. For example, "Christmas starts at midnight on the 25th of December 2015" is a LocalDateTime. Midnight strikes at different moments in Paris than in Montréal, and different again in Seattle and in Auckland. LocalTime ldt = LocalDateTime.of( ld , lt ) ;  // Xmas morning anywhere. Another example, "Acme Company has a policy that lunchtime starts at 12:30 PM at each of its factories worldwide" is a LocalTime. To have real meaning you need to apply it to the timeline to figure the moment of 12:30 at the Stuttgart factory or 12:30 at the Rabat factory or 12:30 at the Sydney factory. The word “Local” in these class names may be counter-intuitive to the uninitiated. The word means any locality, or every locality, but not a particular locality. So for business apps, the "Local" types are not often used as they represent just the general idea of a possible date or time not a specific moment on the timeline. Business apps tend to care about the exact moment an invoice arrived, a product shipped for transport, an employee was hired, or the taxi left the garage. So business app developers use Instant and ZonedDateTime almost exclusively. On the other hand you should use the Local… types for booking future events (ex: Dentist appointments) far enough out in the future where you risk politicians redefining the time zone with little forewarning as they so often do. For appointments, store a LocalDateTime along with a ZoneId. Later, when generating a schedule, on-the-fly determine a moment by calling LocalDateTime::atZone( ZoneId ) to generate a ZonedDateTime object. ZonedDateTime zdt = ldt.atZone( z ) ;  // Given a date, a time-of-day, and a time zone, determine a moment, a point on the timeline. If needed, you can adjust to UTC. Extract an Instant from the ZonedDateTime. Instant instant = zdt.toInstant() ;  // Adjust from some zone to UTC. Same moment, same point on the timeline, different wall-clock time. 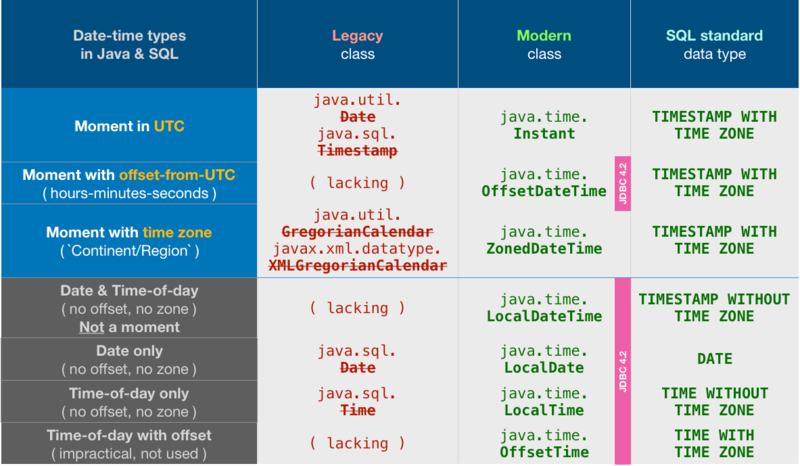 For completeness, here is a table of all the possible date-time types, both modern and legacy in Java, as well as those defined by the SQL standard. This might help to place the Instant & LocalDateTime classes in a larger context. One main difference is the Local part of LocalDateTime. If you live in Germany and create a LocalDateTime instance and someone else lives in USA and creates another instance at the very same moment (provided the clocks are properly set) - the value of those objects would actually be different. This does not apply to Instant, which is calculated independently from time zone. LocalDateTime stores date and time without timezone, but it's initial value is timezone dependent. Instant's is not. Moreover, LocalDateTime provides methods for manipulating date components like days, hours, months. An Instant does not. Both classes have the same precision. LocalDateTime does not store timezone. Read javadocs thoroughly, because you may make a big mistake with such invalid assumptions: Instant and LocalDateTime. The difference between the two is that Instant represents an offset from the Epoch (01-01-1970) and, as such, represents a particular instant on the time-line. Two Instant objects created at the same moment in two different places of the Earth will have exactly the same value. Instant corresponds to time on the prime meridian (Greenwich). cannot represent an instant without additional information such as an offset or time-zone. Not the answer you're looking for? Browse other questions tagged java datetime java-8 or ask your own question. How does Java manage summertime? Adding n hours to a date in Java? How do I do calendar arithmetic with java.util.Date? Query on Date only with Spring Boot Data JPA / Java 8 Instant? How to format java.time.LocalDateTime and java.time.LocalDate with pattern? What's the difference between map and flatMap methods in Java 8?